death worlds, interdimensional horrors, endless war, and ennui? Eric: As a teenager, one summer I decided I wanted to learn all of the trick taking card games, a genre that I found strangely fascinating. (I suppose this tells you a lot about me as a teenager and the rural midwestern world of the United States where I grew up.) I learned the rules for Spades, Pinochle, and Pitch. I sort of learned how to play Bridge. I at least read the rules for Whist and Euchre. At the end of the process, though, I found myself feeling confused. In theory, I knew the variations between these games should excite and engage me. In practice, I was at a loss to differentiate one from the other. None of them could really hold my interest. 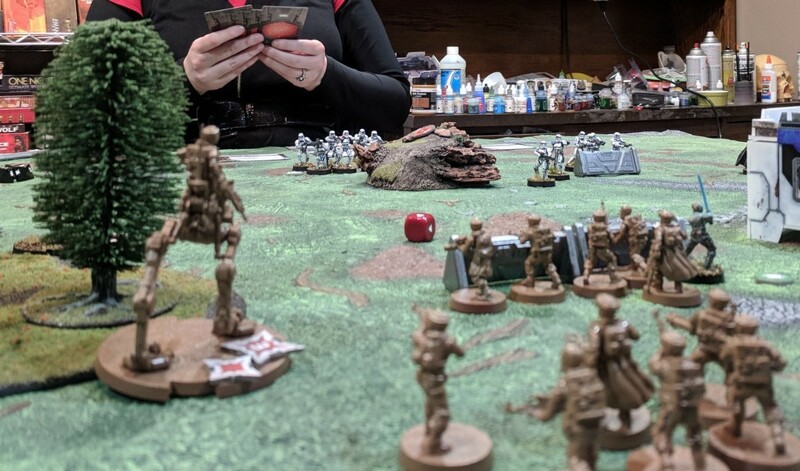 That is probably a strange place to start my review of Games Workshop's newest offering, Kill Team! A re-release of a variant of Warhammer 40,000, the game's big selling point is its size. 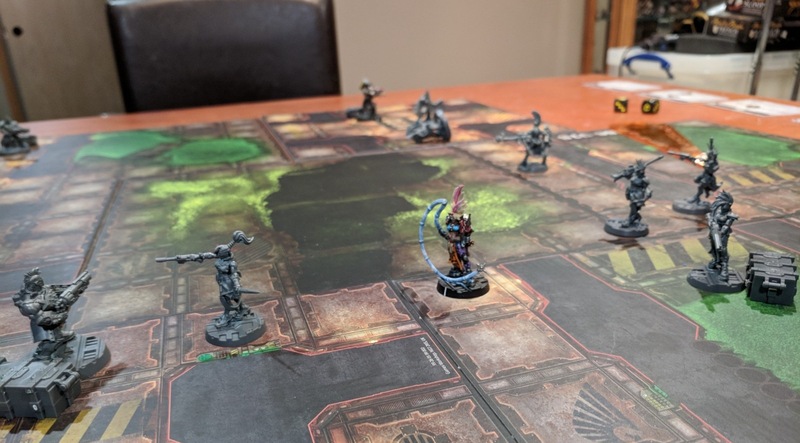 Unlike the sell-your-car-budget armies of its larger cousin, in Kill Team each player uses a small band of 5-20 miniatures to do battle in a space designed to fit on a kitchen table. As I've played around with it, though, I find myself at a loss as to what to say. 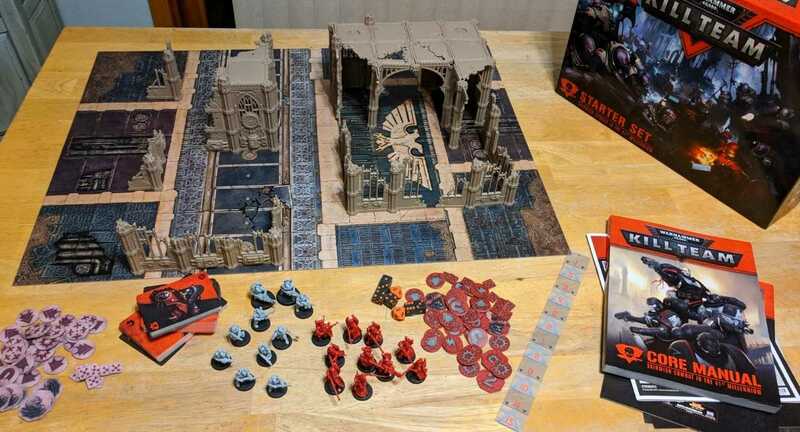 Kill Team is, at the same time, an exhausting incremental iteration on a tired system... and the best thing Games Workshop has released in years. Who remembers Quinns' anciente video reviewe of 1812: The Invasion of Canada? 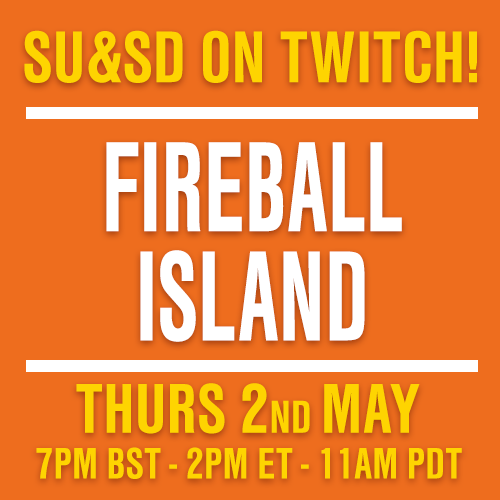 Well, today we've got a redux for you! It's our review of the latest game in that series, 878 Vikings, as well as the Viking Age expansion. And boy, those mechanics have stood the test of time. It's still tons of fun to invade a country with a buddy, rolling handfuls of dice together and stretching your armies too far, too fast. 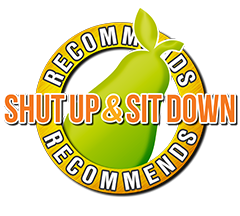 Click play and find out why Quinns calls this series the mac & cheese of wargaming. Eric: Star Wars has always had a strange magic for me, a modern mythological mojo which transcends its contrived plots and sometimes stilted dialog. I first felt the tingle of that power when I was seven years old. It was an open house at a local technical school. Back in a corner, away from the admittedly-modest crowds, was a little display for a “flat screen” television, cutting edge technology of that long, long time ago. The exhibit had just started, and as I walked up, two droids were surveying the blasted landscape of Tatooine. Perched on a ledge, I sat for the next six hours and watched the entire trilogy, lost in a galaxy far, far away. That makes Star Wars: Legion, the new miniatures game from Fantasy Flight, hard to review. It tempts me to be too generous – just putting a lightsaber in someone's hand provokes the ghost of a chill. At the same time, it makes me worry I will set the bar too high. To have expectations no collection of cardboard and plastic could ever meet. I say this to acknowledge that I come to this game as the farthest thing from a blank slate. I am a fanboy, with all the enthusiasm and critical nitpicking that entails. Eric: A few years ago I had the chance to revisit the grade school I attended as a child. It was a jarring afternoon. The huge hallways were suddenly kind of small. I could see over the bookshelves in the library where I used to get lost. The teachers... several of them were younger than me. I walked in the door feeling nostalgic; I left a bit unsettled. I found myself remembering that visit as I got ready to open Games Workshop's new remake of Necromunda. A skirmish game set in the collapsing underbellies of hive cities in the Warhammer 40,000 universe, the original Necromunda one-upped the grim darkness of the 41st millenia by adding gangs, drugs, slavery, abject poverty and child soldiers. To a 15-year-old me, it was a thing of glorious joy. Yet I wondered, would this turn out to be just another narrow-halled school with five-foot bookshelves? Quinns: Matt, are you ready to review the Rise of the Empire expansion for Star Wars™: Rebellion? 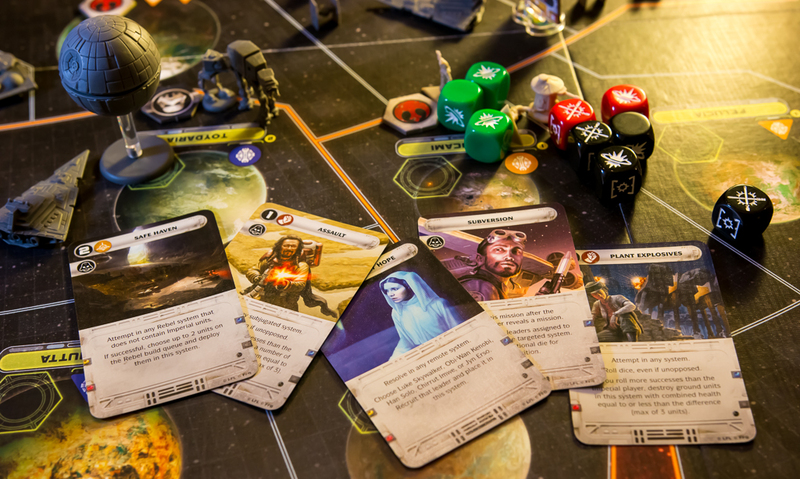 To bring everyone up to speed, Rebellion is a grand 2-4 player game set in the Star Wars universe, which I reviewed and said it was fun, but I couldn't quite recommend it. Eric: For any of what follows to make sense, I need to take you to a place in my past. Imagine the house where I grew up. Follow me down into the basement, past the unfinished walls and pantry shelving and washing machine. Back here, hidden under the stairs. Do you see it? It isn't much to look at – an austere, industrial thing. The kind of desk I now imagine factory workers flipping over in some proletarian revolution. But I spent huge amounts of my late childhood and early teenage years here. Pouring through those roleplaying manuals stacked in one corner, drawing elaborate maps on that graph paper, and – as the spackling of color attests – painting the little figurines that line the shelf above. Those were my first space marines. 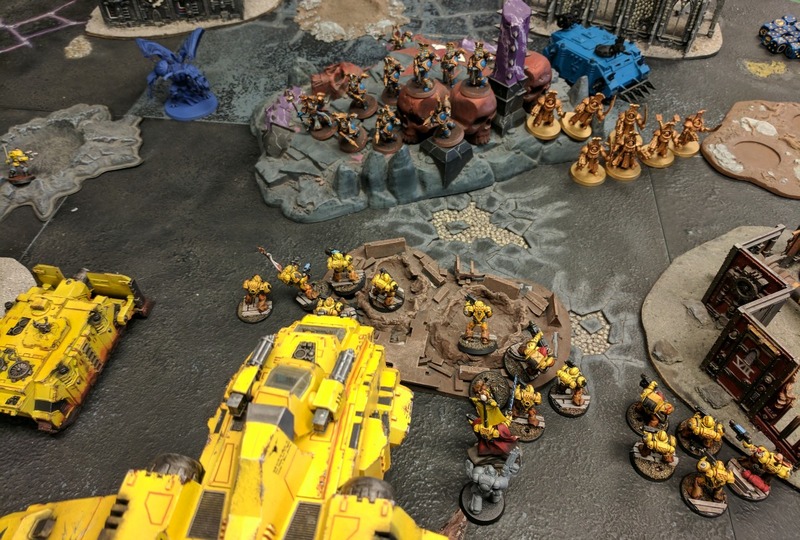 About a month ago, Games Workshop released their 8th edition of the Warhammer 40,000 rules. Back when I was painting at that desk, it was 3rd edition I played. As much as those iterations between then and now can be seen as cynical cash grabs – partly because some of them were – there is something noteworthy about this new one. But more on that in a minute. Eric: I'm standing here, what feels like a katana in my chest, the bodies of my soldiers piled around me. I'm standing here defeated and absolutely delighted, a big grin on my face, trying to figure out what it's doing there. 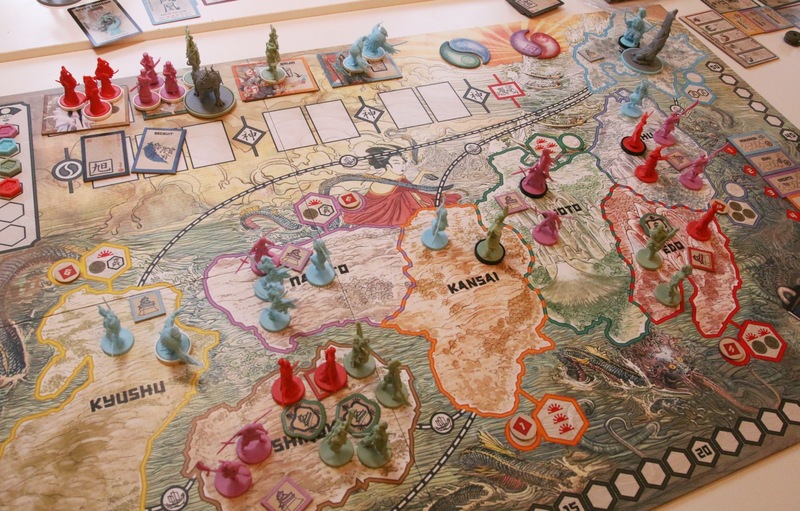 That was the end of my second play of Bushido by GCT Games - the actual impaling being only metaphorical, if you're the queasy sort, but the defeat and delight being real. From my first encounter, what intrigued me about Bushido was that I found it immensely pleasurable even when I lost horribly. Let me try to explain why. 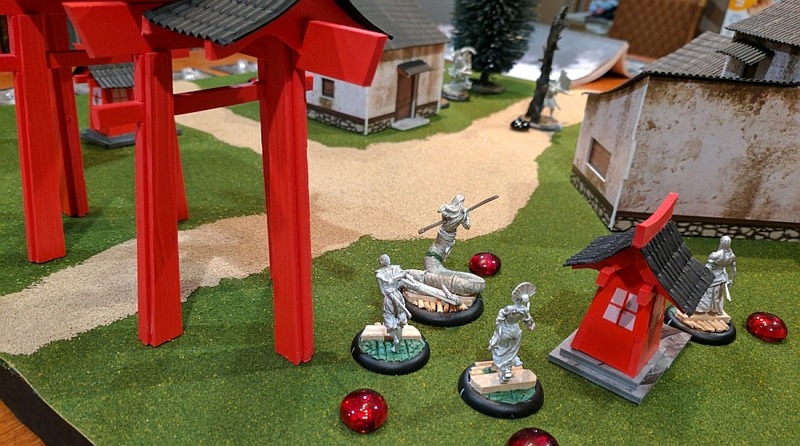 If the name and picture don't make it apparent, Bushido is a tabletop skirmish game set in a world inspired by Japanese folklore, or at least a western, Tolkein-filtered riff on Japanese folklore. Elves and Dwarves are replaced by Tengu and Oni, the heroes include snake-people and warrior pandas, and the outfits look like the result of a raid on a Kurosawa film's prop closet. All in the best possible way.